Parental Ideas: AYL Waterproof Speaker perfect for outside parties! AYL Waterproof Speaker perfect for outside parties! 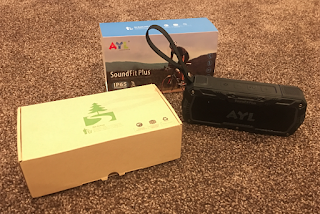 I received the AYL SoundFit Plus Waterproof Bluetooth Speaker from Amazon.com recently and tested it out. This is a perfect speaker to use for outdoor parties if you want some great background music. It's totally wireless and self-enclosed so it is waterproof so you can have your music source (phone, computer, whatever) in the house and then the speaker outside exposed to the elements. It also has applicability in an office setting if you need a speaker for a presentation or a speakerphone for a conference call (yes there is a built-in microphone) this is a great accessory! NOTE: I was provided this AYL speaker complimentary to facilitate this review. All opinions are my own.